Our best selling traditional toy. At the car service centre children will be able to act out the daily activities of cars being repaired, refuelled and washed and then transported to wherever their imagination takes them. The service centre is realistic and will provide hours of enjoyment and fun. 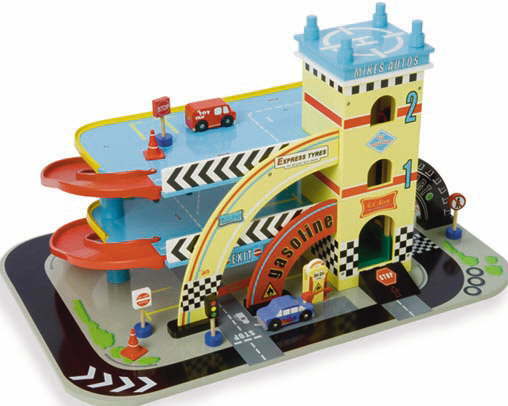 Includes 2 vehicles, 4 road signs and 4 traffic cones for added play value. Features include wind up/down lift, helipad and spiral ramps allowing access to 2 floors. 1950's retro style and mounted on a big "race track" baseboard. This is a very high quality wooden toy and we guarantee that you will not be disappointed. Dimensions: 48cm deep, 43cm high and 73cm wide.